During floor debate on the House’s omnibus spending bill for fiscal year 2018, Commerce, Justice, and Science Appropriations Subcommittee Chair John Culberson (R-TX) supported a successful amendment by Science Committee Chair Lamar Smith (R-TX) to shift $30.2 million to physical and biological sciences research at the National Science Foundation from other agency activities. Although a small amount, Culberson’s support for the amendment indicates he is sympathetic to Smith’s broader push to prioritize the physical sciences. 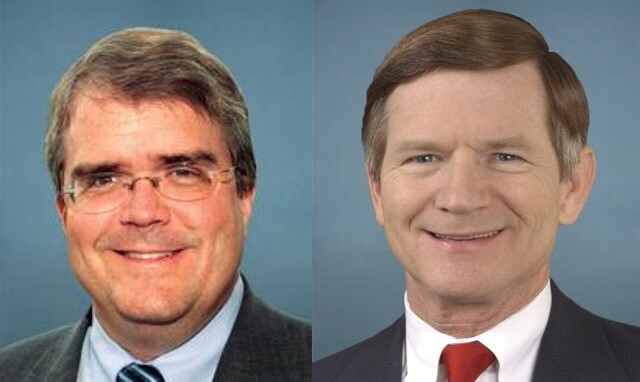 House Commerce, Justice, and Science Appropriations Subcommittee Chair John Culberson (R-TX), left, and House Science Committee Chair Lamar Smith (R-TX). On Sept. 14, the House passed a $1.2 trillion omnibus appropriations bill on a vote of 211 to 198. The legislation, which would fund the federal government through the end of fiscal year 2018, incorporates the eight remaining annual spending bills alongside four the House passed in a security-focused minibus bill this July. During floor debate on the bill, Science Committee Chair Lamar Smith (R-TX) sponsored an amendment to shift $30.2 million to physical and biological sciences research at the National Science Foundation from other NSF accounts. The amendment, which the House agreed to by a voice vote, was notably also supported by Rep. John Culberson (R-TX), chair of the Commerce, Justice, and Science Appropriations Subcommittee. As the House bill does not specify funding for individual NSF research directorates, any specific guidance as a result of Smith’s amendment will be determined in the conference committee report accompanying the final legislation negotiated between the two chambers. The amendment thus did not change any bill language but established the House’s intent. Prioritizing basic research in the physical sciences is part of the Science Committee majority’s formal agenda for fiscal year 2018. One item of that agenda is to require that 70 percent of NSF’s research funds be allocated among four directorates: the Mathematical and Physical Sciences, Computer & Information Sciences & Engineering, Biological Sciences, and Engineering Directorates. House appropriators will have to negotiate with their Senate counterparts during conference committee on whether to include language favoring funding for biological and physical sciences research in the final agreement. Culberson’s support for the Smith amendment is in some tension with his previously articulated stance of deferring to NSF on how to allocate its R&RA account among its six research directorates. Although Smith’s amendment does not specify which directorates would receive the extra money, some may stand to benefit more than others. The House omnibus spending package is not expected to advance to the Senate. It exceeds the current caps on spending and would trigger across-the-board spending cuts called sequestration if Congress and the president are unable to reach a deal to raise the caps. Any revision to these caps, which were set by a 2011 budget control law, would require at least 60 votes in the Senate, necessitating at least some Democratic support. Only one Democrat voted in favor of the bill, so it will likely not have enough support from Democrats in the Senate to receive the 60 votes needed to pass. Congress has to negotiate a final agreement or an additional stopgap spending measure before Dec. 8, when the recently enacted three-month extension will expire. Moving forward, Republican lawmakers will need to seek out Democratic support to achieve final passage. Several amendments sponsored by Dan Lipinski (D-IL) that would direct the National Oceanic and Atmospheric Administration to maintain funding for National Weather Service staff and programs, including $1.2 million to maintain staff levels and activities at the National Centers for Environmental Prediction (NCEP) and $10.1 million to maintain Information Technology Officer (ITO) positions in weather forecast offices. The Trump administration has proposed to consolidate the Climate Prediction Center and Weather Prediction Center within the National Centers for Environmental Prediction and decrease the number of ITOs through a phased consolidation to increase efficiencies. An amendment offered by Rep. David McKinley (R-WV) that would direct $10 million for NOAA to complete build-out and increase electrical capacity for the Environmental Security Computing Center in Fairmont, West Virginia. An amendment offered by Rep. Norma Torres (D-CA) that would increase funding for the National Institute of Standards and Technology’s Manufacturing Extension Partnership program by $5 million, for a program total of $105 million in fiscal year 2018. Several amendments sponsored by Rep. Jamie Raskin (D-MD) that would maintain funding for NOAA’s Climate Research program and the National Weather Service at fiscal year 2017 levels. An amendment offered by Rep. Debbie Wasserman Schultz (D-FL) that would increase funding for NOAA’s Climate Research Program by $24.3 million. An amendment offered by Rep. Bill Foster (D-IL) that would direct NSF to determine Established Program to Stimulate Competitive Research (EPSCoR) eligibility based on per capita funding. Amendments offered by Rep. Darren Soto (D-FL) and Rep. Tom Reed (D-NY) that would increase funding for the National Network of Manufacturing Innovation Institutes, also known as Manufacturing USA, by $20 million. An amendment offered by Rep. Andy Biggs (R-AZ) that prevents funding from being made available for the National Climate Assessment.